Local storyteller David Neilsen presents four spine-tingling cemetery tales of ghoulish ghosts, spooky specters, and fiendish fools. The family that screams together, stays together! Our October events typically sell out - be sure to purchase tickets in advance to avoid disappointment! Dates: Sundays, October 21st and 28th from 5:00 - 6:30 pm. Location: Sleepy Hollow Cemetery Chapel, 540 North Broadway, Sleepy Hollow, NY 10591. 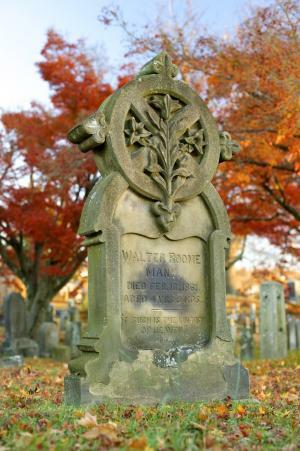 Ticket sales go directly to the Sleepy Hollow Cemetery Historic Fund that helps preserve the monuments and memorials here. We are a nonprofit 501(c)(3) organization.